MSE Creative Consulting Blog: Climategate Update VI -- Debunking the "Hockey Stick"
Climategate Update VI -- Debunking the "Hockey Stick"
If you look at this graph, from my global warming speeches, you see nothing alarming about today's temperatures. The Medieval Optimum (or Medieval Warm Period, MWP) was when the Vikings colonized Greenland and grapes were grown in both northern England and in Newfoundland. 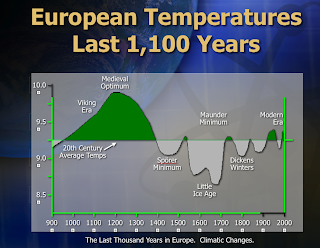 While this graph is specifically for Europe, is believed by many that much of the world enjoyed temperatures warmer than today. So to illustrate the threat of human-caused global warming, "[we] had to get rid of the Medieval Warm Period." 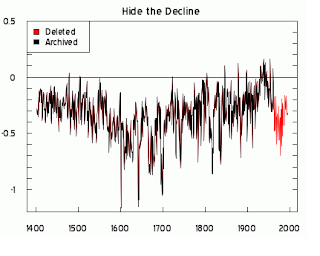 One of the most iconic images of the pro-global warming is known as The Hockey Stick. Here is one of its incarnations. There is no MWP. It purports to show not only the rapid temperature rise in recent years but also how recent temperatures are the warmest of the last 1,000. It used tree ring data that was supposedly correlated to temperatures. Why is this important to global warming alarmism? Because, if today's temperatures are lower than the naturally caused temperatures 800 years ago, there's not much to worry about in the short to medium term. 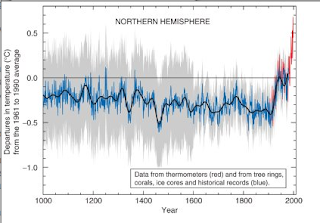 Here is the story of the last nail in the coffin of the hockey stick, courtesy of Climategate. And, if you want to read about how the invaluable Steve McIntryre revealed climate science trickery again, the story is at this link. If you have been reading about the Climategate emails that discuss "the trick," let me explain what the trick was. 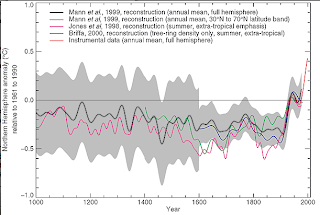 The green line is the famous Keith Briffa tree ring temperature reconstruction as shown by the IPCC. Note that it shows temperatures falling after about 1964. However, the thermometer record (black line) showed rising temperatures at the same time. So, in the final version they cut off the Briffa data after 1964! That generated the smooth, and alarming-looking, curve (first graph in this post) and a bit of an optical illusion that the data meshes well. The data clearly does not mesh in this closeup. Gavin Schmidt of realclimate.org said the trick was "hidden in plain sight." He would have a point if all of the data had been shown. It wasn't, as this final graph from Watts Up With That shows. 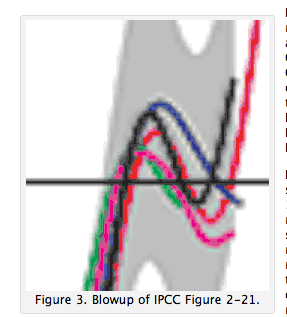 The orange data is the tree ring data they omitted the above IPCC report figures (middle two graphs). Had they shown the orange data, any person looking at the obvious divergence would arrive at the correct conclusion the tree ring data is not valid. The people involved in this in both Britain and in the United States are now under investigation.